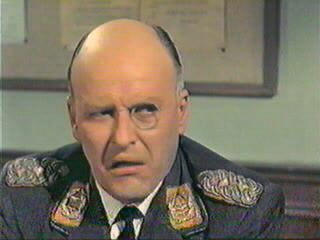 Werner Klemperer was born March 22, 1920, in Cologne, Germany to a Jewish family who fled the Nazis and came to the United States during the 1930s. Klemperer, the son of famed symphony conductor Otto Klemperer, was the co-star of the 1960s "Hogan's Heroes," playing the commandant of a German prisoner of war camp. The irony of starring in a popular comedy series about Nazis and Allied POWs could not have been lost on Klemperer, who was a refugee from Nazi Germany. Klemperer became an audience favorite and won two Emmy awards. He was Emmy-nominated five times. His film and TV career began in the early 1950s when he essayed roles on shows including "Alfred Hitchcock Presents," "Maverick," "Gunsmoke," "How to Marry a Millionaire" and "Alcoa Presents." In 1961 he portrayed his first Nazi in the title role of the film "Operation Eichman," which co-starred Ruta Lee and John Banner, who later was a staple of "Hogan's Heroes." That same year he appeared with an all-star cast in "Judgment at Nuremberg," "Death of a Scoundrel," "The Goddess" and "Ship of Fools." Klemperer received a Tony nomination for his performance in the Hal Prince revival of "Cabaret." He appeared with Jose Ferrer in "The Insect Comedy" and Tallulah Bankhead in "Dear Charles." He portrayed the role of Prokoviev in "Master Class" at the Kennedy Center and also appeared in productions of "Idiot's Delight," "Hang on to Me" and "The Visions of Simone Marchand" -- all for theater director Peter Sellars. He most recently appeared on the stage in a co-starring role in the Circle in the Square's production of Chekhov's "Uncle Vanya." He was first elected to the Council of Actors' Equity in 1973 as a replacement. Beginning in 1974 and through 1989, he was elected to three consecutive five-year terms as a Principal Councillor. In June of 1988, he was elected 4th vice president, a post he held until 1994. As a narrator, Klemperer appeared with nearly every major symphony in the United States including New York, Chicago, Boston, Philadelphia and Los Angeles. His repertoire included such works as Gerhard's "The Plague," Beethoven's "Egmont" and "Fidelio." On the opera stage, he appeared as Pasha Selim in the premiere of John Dexter's Metropolitan Opera production of "The Abduction of from the Seraglio" and as Max in "The Sound of Music." Klemperer died at the age of 80 died at his home on December 6, 2000, suffering from cancer. He was most remembered as the fumbling, ridiculous Nazi prison camp commader Col. Klink in television's "Hogan's Heroes," which also starred Bob Crane, Richard Dawson and Robert Clary and ran on CBS from 1965 to 1971. Klemperer, who received Emmy nominations in each of the show's six seasons, won his supporting actor awards in 1968 and 1969. The show is still widely seen in syndication and on cable. More recently, he had appeared on many talk shows including ABC's "Politically Incorrect." His other films included "The Goddess" (1958), "Operation Eichmann," in which he played the title role, "Judgement at Nuremberg," (1961), and "Ship of Fools" (1965). In recent years he appeared on Broadway, notably in revivals of "Cabaret" in 1988 and "Uncle Vanya" in 1995. He also often appeared in operas and as a narrator for concerts by symphony orchestras across the nation, including the Mostly Mozart Festival Orchestra, whose "Impresario" was broadcast on PBS. Operatic roles included "Die Fledermaus," "The Sound of Music" and "The Abduction From the Seraglio."